. : Rolex Middle Sea Race News :. What is the Rolex Middle Sea Race? The Rolex Middle Sea Race is a highly rated offshore classic, often mentioned in the same breath as the Rolex Fastnet, The Rolex Sydney - Hobart and Newport-Bermuda as a "must do" race. The Royal Malta Yacht Club and the Royal Ocean Racing Club co-founded the race in 1968 and 2017 will be the 38th Edition. Save for a break between 1984 and 1995 the event has been run annually initially attracting 25 -30 yachts, however in recent years, the number of entries has risen sharply to 122 boats thanks to a new Organising Committee who managed to bring Rolex on board as title sponsor for the Middle Sea Race. This year's edition will be held on Saturday 20th of October 2018. In this section you find an image portfolio, taken by amature photographers, of the Malta Rolex Middle Sea Race 2018. If you want a High Definition copy of any of these images, for free, please send an e-mail to simdeb@simonestates.com , mentioning the reference number of the Image you require. Our aim is to promote the Middle Sea Race as one of the best and most beautiful Races in the World. 20.And in a Surprise to end all surprises, the French “Solenn” has taken the 1st overall, in the Rolex Middle Sea Race. We saw the Italians, British, Americans and Germans battling it out for the top 4 places. But their boats were heavily punished by the inherent handicaps in the IRC and ORC Race grading system, due to the mind blowing technology used. Trimarans, hydraulically operated canting keels, etc. 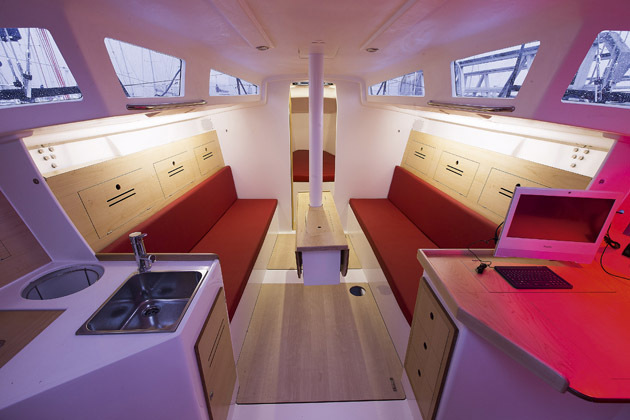 Solenn is one of the new JPK 11.85 racing yachts skippered by Ferard Ludovico. So where did this boat come from. Most have never heard of the JPK’s. Well you have not been listening then, have you ? JPK’s first major success was winning its class in the 2007 Rolex Fastnet Race with the JPK 960. 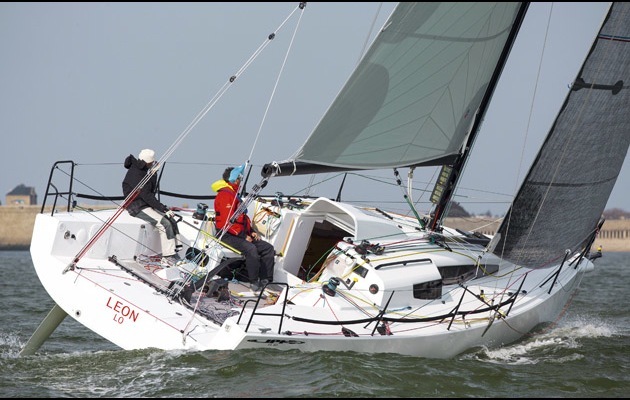 But it was its performance in the 2013 Fastnet that launched the company into the spotlight when one of its JPK 1010s, sailed double-handed, hit the headlines. Not only won the 2 handed class & beat an identical fully crewed boat, but bested the entire 340-boat Fastnet fleet to take overall victory. The design was no one off either; various JPK 1010s had already delivered some impressive results round the cans, demonstrating the boat’s versatility. The company the worked on a bigger boat. Designed by Jacques Valer, the first 1080 was launched in February 2014 and quickly made an impression, not least for her looks – her angular stepped-in coachroof gave her the look of the cab windows on a steam locomotive when viewed from head on. But this detail, along with others, is more than just styling; it has practical benefits. “Stepping the coachroof inboard allowed more space for the transverse genoa tracks while also providing good visibility forward from below,” says company founder Jean Pierre Kelbert. “This is especially useful when you’re sailing short-handed.” On deck the recess also provides a good means of bracing yourself when working on the foredeck, and an area forward and to leeward for the full crew to huddle in when the breeze goes light. Not only that, but this boat has also won the Rolex Middle Sea IRC6 class of 2018, yesterday. This is one boat that you want to be looking very closely at. 19.The first 3 yachts in from the Rolex Middle sea Race. From right to left, Italian Maserati, British PowerPlay and American Rambler. Could this be the new world order, in reverse ? 18.The the Botin (Cay) 55 racing Yacht “Caro”, skippered by German Maximilian Kink, sailing past St Paul’s Bay, right now. Caro is now ranked 1st in IRC1 and 2nd in ORC1 and 6th in Line Honours. The spectacular 2018 edition of the Rolex Middle Sea Race is slowly drawing to an elegant close. There is a reason why it is known to be the “Beautiful Race”. 17.MASERATI, the Italian TriMaran, is just over an hour away from its second win “Line Honours” of the Rolex Middle Sea Race. Just 27 nautical miles off Malta, streaming forward at a blinding 26 knots, Maserati should soon be visible off the Malta-Gozo Channel, then at around 22.15 across the Northern seaboard of Mellieha, Xemxija, St. Paul’s Bay, Bugibba, Qawra, Salina, Bahar ic Caghaq, Madliena, St Andrews, Pembroke, St. Julians, Sliema and finally, The Sliema Creek side of Valletta. Now is your chance to watch a magnificent TriMaran racing past in its conquest of the first in of the Rolex Middle Sea Race. Congratulations to skipper Giovanni Soldini and his winning crew, fingers crossed. They are followed by British TriMaran PowerPlay, American R88 Rambler and German Momo. 16.Morning update of Rolex Middle Sea Race 22.10.18 8.50am. MASERATI STILL IN THE LEAD cruising at 8.7kn, with a 40 nautical mile lead over her closest challenger, the British “PowerPlay”. Maserati, a Multi 70 TriMaran skippered by Captain Giovanni Soldini. Maserati has 215 nm left to go before finishing the race and is powering towards the westernmost waypoint, the island of Pantelleria, which she should reach within the next few hours. Barring a catastrophic failure, the lead established by Maserati is considered to be unassailable. Interestingly there is another battle going on between the 2nd placed UK TriMaran PowerPlay (skippered by Ned Collier Wakefield) sailing at 12.7kn and the American Rambler R88, skippered by George David creeping up at 6.2kn. Rambler is consistently closing the distance, now with just 8nm separating them. An interesting note is the sailing line taken by Maserati, represented by the thick green one in the map below, which is dramatically different from the sailing line followed by the others, displaying an intimate knowledge by the Italians of the naval topography and winds. None of the other boats have emulated this line. 15.With most of the fleet having passed the Straits of Messina, the Italian Maserati TriMaran has built up an unassailable 33 nautical miles lead over the 2nd placed British PowerPlay. Facing a headwind all the way to Faminiana (top left side of Scicily), with 325 nautical miles to go, the fleet should enjoy a tail wind thereafter, all the way to Lampedusa. Maserati is still doing 8 knots, as opposed to PowerPlay and 3rd placed Rambler(trailing by another 8nm), who are both only doing 7 knots. 14.3rd placed Rambler (an R88) is passing through the Straits of Messina right now. Rambler has picked up speed from 4kn up to an hour ago to 6.4kn right now. MASERATI has also picked up speed from 4.2kn to 8kn and is streaming ahead to Faminjana (top left hand side of Scicily) Rambler is owned and Skippered by George David, Designed and built by New England Boatworks, the class is Juan K, LOA: 88 built in Year: 2014. 13.MASERATI HAS JUST PASSED Stromboli and is still in the lead, by a wide margin. Boats will hit a dead zone under Stromboli, where there is no wind and still waters. DAY 2 midday UPDATE - A Change in Tempo After an upwind passage to Capo Passero, the southernmost tip of Sicily, on the first day of the Rolex Middle Sea Race, as expected, the wind faded at sunset and the tempo changed. George David's American Maxi Rambler 88 managed to maintain momentum at the front of the IRC fleet. Rambler passed Siracusa approximately two hours ahead of Dieter Schön’s German Maxi72, Momo, and the Baltic 115, Nikata. PowerPlay and Maserati have both tasted the lead in the Multihull fleet, Peter Cunningham's PowerPlay led all the way to Capo Passero, and then took a course inside the rhumb line to Messina and close to the Sicilian coast, initially pulling out a ten-mile lead. Giovanni Soldini's Maserati meanwhile headed further east, and eventually found more pressure during the night to come back and overtake PowerPlay just abeam of Etna. Maserati passed through the Strait of Messina 2hr and 37 minutes ahead of her closest rival and has just now passed Stromboli. Boats will hit a dead zone under Stromboli, where there is no wind and still waters. The remainder of the record fleet continues to negotiate the leg up eastern seaboard of Sicily, making the best of light head winds to make Messina, and beyond. 115 yachts, from the 130 in total, are competing for the overall win under the IRC rating rule. While it is still too early in the race to predict the overall and IRC Class winners, the Podesta family racing their Maltese First 45 Elusive 2 have made a tremendous start, as have Periklis Livas & Nikos Lazos' Greek Farr 52 Optimum3, the 2004 Rolex Middle Sea Race winners. Giuseppe Greco's Verve-Cramer and Marietta Strasoldo's Lunz Am Meer will also be pleased with their early form. Other teams faring well in their respective IRC classes are: the German Botin 65, Caro, skippered by Maximilian Klink, Dominique Tian's French Ker 46, Tonnerre de Glen, Nicolas Ibañez Scott's Chilean J/122, Anita. Jamie Sammut's Maltese Solaris 42, Unica, is fairing very well in the Double-Handed Class. A fierce battle in IRC Six has four yachts all in close contention for the lead: Timofey Zhbankov's Rossko, Piercarlo Antonelli's Bora Fast, Gerard Ludovic's Solenn, and the 2017 overall winner, Igor Rytov's Bogatyr. “Good morning!” commented Gerard Ludovic's Solenn “Chasing light winds all night long, sometimes with luck, sometimes less lucky... fighting with Rossko and Bora Fast, and Bogatyr who came back cleverly!” At 0900 CEST, 21 October, none of the 130 starting yachts have retired. Sadly, Giuseppe Bisotto's Atame would have made the fleet number 131 had she not suffered rig damage immediately before the start. 'Beppe' is a veteran of the race, a real character, and will now enjoy a holiday in Malta. 12. MASERATI BACK IN THE LEAD. In what must have been the mother of all surprises, the Italian TriMaran captained by old sea dog Skipper Soldini, made a dramatic recover from a damaged tiller and powered past the British TriMaran PowerPlay. Racing at 15 knots through the Straits of Messina, Maserati now commands a 4 nautical mile lead over Power play, that is still to clear the Straits of Messina. Maserati in now powering towards the Volcano Stromboli, in what is the northernmost way-Point of the Rolex Middle Sea Race. Stay tuned to this spot for more of the most riveting yacht racing news to be had this year, as delivered to you by the beautiful race. 11. The Leader Board right now, of the Rolex Middle Sea Race. British Trimaran PowerPlay leading, sailing at an average of 8.6 knots average. PowerPlay is 1 Nautical Mile ahead of Italian Maserati. They are approaching Catania and the majestic Mount Etna, 10 hours after the start of the Race. In 3rd Place is Rambler, at 7.8 knots average, tailing 33 Nautical miles from the leader PowerPlay. Coming in 4th is Momo, at 7.4 knots average, followed by Nikita and Allegra. 10. BREAKING NEWS : Disaster strikes the leading Italians. Damages aboard Maserati (Multi70 tracing TriMaran) : the right-side rudder's fitting broke. Captain Soldini says “but we keep going on and we will do our best!” Maserati was the favorite to win this year’s Rolex Middle Sea Race. It had a similar mishap last year, but managed to steal a win over the American Phaedra 3 when the Americans mistakenly turned by the island of Linosa way-point, instead of Lampedusa island. This time the Italians’ luck seems to be running out. British tri-maran PowerPlay pulls ahead, now with a 2 Nautical mile lead, racing full steam ahead to Catania. PowerPlay (formerly known as Concise 10), is owned by Peter Cunningham’s and is an English MOD 70, currently skippered by Ned Collier Wakefield. 9. The Battle between the English and a the Italians continued off Siracusa, where PowerPlay of Skipper Ned Collier Wakefield over took the Maserati of Captain Giovanni Soldini, AGAIN. Facing strong North Easterly winds, head on, the skills of the hardened sailors in white-water conditions, are now coming into play. The Rolex Middle Sea Race is turning into one of the largest sea battles since the Battle of the Mediterranean of the 2nd World War. Watch this spot for the latest updates info of this match of the Titans, as they pass the volcano Mount Etna and subsequently the Straits of Messina. 6. The 6th batch of the real cool maxi cruisers, 100% pro sailors, Kevlar sails, carbon fiber construction and masts, in the batch before last of the Rolex Middle Sea Race, in Malta, right now. An absolute beauty to watch the gentle giants sailing out of the Valletta Grand Harbour in Malta, live, today, on their way to a 606 mile race over the next 4 days. Watch this spot. 5. Launch of the 4th batch of the faster optimized cruisers, manned with hardened professional racing sailors, live right now in the Rolex Middle Sea Race. No confusion in the batch, now all racing towards the mouth of the Valletta Grand Harbour to launch into the white water sea awaiting them. 4. The 3rd batch of Yachts being launched, sort of the fast family cruisers, of the Rolex Middle Sea Race, from the majestic Valletta Grand Harbour. No confusion whatsoever this time around. 2. 20th October And the Rolex Middle Sea Race has started now at 11am with the Italian TriMaran Maserati leading. Maserati wound Line Honours last 2016 year. 1. Rolex Middle Sea Race: Schedule of Events The 2018 Rolex Middle Sea Race will start on Saturday 20th October. This will be the 50th anniversary of the first edition. SATURDAY 20TH OCTOBER: Start Rolex Middle Sea Race (11:00) SATURDAY 27TH OCTOBER: Rolex Middle Sea Race Maltese Boats Taking part in the Rolex 2018 Race COMANCHE RAIDER ELUSIVE 2 : Has a long history with a number of class wins to there name JARHEAD YOUNG SAILORS FOUNDATION : is made up of young group of racing on a J109 MALTESE FALCON II : sees a mix of veteran and newbie sailors to the Rolex MiddleSea Race.